Billings has challenged Amelia academically, widened her global thinking, and stretched her artistically. It’s even sparked an interest in sports! She has built a community of classmates, teachers and advisers to prepare her for the next steps in her journey. In short, Billings has made our transition to the Pacific Northwest better in ways we could not foresee. 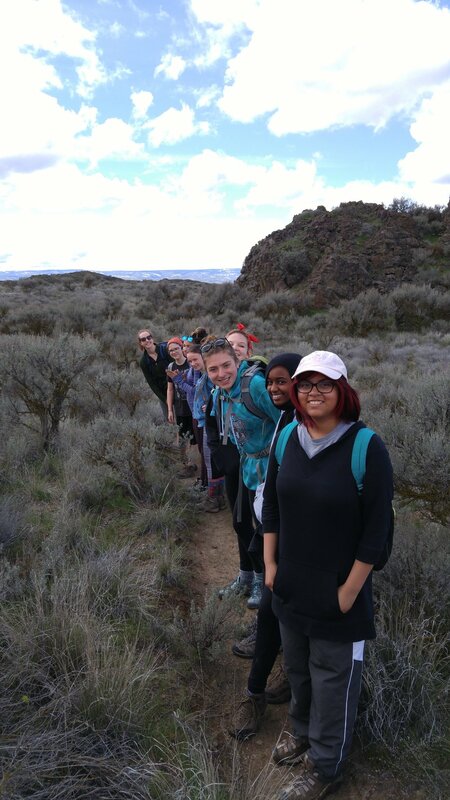 Billings students get to expand our expectations of ourselves on lots of outdoor adventures. Through this I have changed as well. I no longer dislike the outdoors in general, but I am also far more comfortable with camping, backpacking, cross-country skiing, snowshoeing, hiking and trekking. Wow, that's a lot in just 2.5 years! I have learned that while I often complain, I can actually have a good time doing something when I try and if I set my expectations of myself accordingly. My teachers and advisors were so supportive of me and were awesome in helping me make learning and outdoor education fun. Risk, courage, collaboration, mastery, creativity, fun, and growth. These are the words I use to describe my time at Billings. That’s what I will take with me into high school and into life. That’s what makes Billings special. These words are what I believe define all the teachers in the Billings Community. Not only are they here to teach us, but they make themselves and their students better people with every day that passes. - Anasophia S. (Class of 2013). Harper has found her place. She has found friends and looks forward to going to school every day. Her confidence in herself shows in and out of the classroom. "The most important take-aways? Well, I'm in college and I'm still applying what I learned at Billings. I learned to know myself as a learner, to work with teachers, and to advocate for myself. I learned what it means to be known, and sometimes people go through life without understanding that. I learned how to work in any kind of group with all kinds of people--when I got to high school I found kids who had already been at school for 4 years and they knew one way to learn, one system, and they always partnered with the same people. At Billings I learned how to work with everyone and to understand others' strengths. And I learned that school can be fun and learning can be fun. What a gift, right?" "I am glad that we chose a middle school for our son. He changed so much over those three years. The school we would have chosen when he was entering 6th grade would not have worked for the person he became. His growth was for greater than I could have predicted." "They really spend time with every single kid. Each child has his or her education catered to his or her needs." "We value the experiential and expeditionary experiences that get the students up from their desks and outside, learning their place in the world. We appreciate how Mason is being nourished academically and socially while going through the inevitable turbulence of adolescence." "Anna came to Billings an incredibly quiet student. In elementary school, she rarely spoke up in the classroom. Many of you saw that underneath that quiet outside, there was strength and the potential for her voice to be heard and for her to lead. Over the past three years, you have worked to draw her out. The outdoor trips provided extra space for this to happen. After every trip she went on, she came back not only happy but alsmo more confident and sure of herself. I remember Seth and I looked at her after she got back from the coast trip last year and said, "whoa--she seems older!"